There’s been a buzz lately around the Bulls and the NBA that Taj Gibson should be a strong candidate to win the NBA’s Sixth Man of the Year award. And, indeed, he deserves to be among the leaders, if not the winner. TNT broadcaster Steve Kerr suggested it during a Bulls national broadcast last month. And Gibson admitted earlier this week it would be special to him. But while Gibson is deserving, he perhaps best exemplifies — maybe even in the history of the award — the NBA’s Most Improved Player. Most Improved is a difficult award to judge because the criteria is so divided and unclear. It generally goes to a player who has increased his scoring. Recent winners have included Paul George, Ryan Anderson, Kevin Love, Aaron Brooks and Danny Granger. But generally these players are able to improve their scoring by simply playing more. Some voters pick All-Star type players like Love, who simply get more opportunities. Others prefer players who come on with lesser known credentials. But they also tend to merely get more opportunity, like the Suns Gerald Green this season. The current speculated candidates have covered a wide range, among them Lance Stephenson, Goran Dragic, teammate Green, Isaiah Thomas, Shawn Livingston, Anthony Davis and Miles Plumlee. Certainly all have improved, though they generally do the same thing. Just more often. Gibson should be the model for Most Improved because here’s a player who should change his name. That’s because he doesn’t even resemble the player he’s been his first four seasons with the Bulls. Gibson, even starting as a rookie, was a hard working rebounder, a grunt player with virtually no offensive game and who actually seemed in decline since averaging a career best nine points per game as a rookie in 2009-10. Gibson was a late comer, the 26th pick in the 2009 draft after a good, but unheralded three years at USC. He averaged 12.4 points and 8.5 rebounds and given that he was 24 years old when drafted, most projections had him a low first or high second round pick. Gibson was thrust into starting as Bulls rookie when Tyrus Thomas was hurt and averaged nine points and 7.5 rebounds. But his averages in just about every category declined his next three seasons as he didn’t average more than 5.7 rebounds again and last season just got back to eight points per game. His shooting never reached his 49.4 percent as a rookie and he had no go to move and a relatively poor shot with free throw shooting well below 70 percent. Gibson was worse in the playoffs last season, averaging 6.5 points and three rebounds and virtually no factor in the poorest playoff performance in his career. He’d signed a $33 million, four-year contract extension before the start of the 2012-13 season, and it looked like a major mistake for the Bulls. Now, it looks like one of the best value contracts in the NBA. This season it’s Gibson with his strong defense, but also, stunningly, one of the most sophisticated post games in the NBA and a knock down baseline jumper. But this is hardly just the praise of friends. 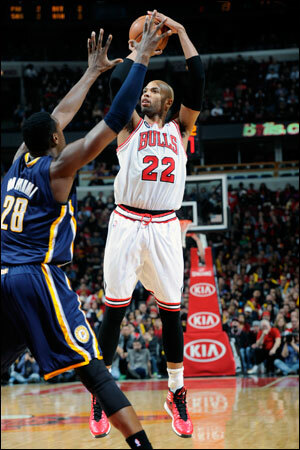 Pacers coach Frank Vogel labeled Gibson the difference in Monday’s Bulls win over the Pacers. And big games against tough teams have been a staple for Gibson this season. Gibson had 20 points and 15 rebounds in the win in Dallas; he had 21 in the win over Golden State; he had 20 and 10, though the Bulls lost in Miami last month; he had 24 and 12 in beating the Hawks when they were hot last month; he had 26 and 13, though the Bulls lost in Golden State; He had 19 in the road win in Phoenix and 20 and eight at Brooklyn on Christmas Day. It’s clearly been a breakout season for Gibson. 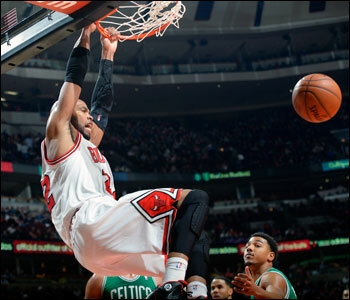 The athletic 6-9 forward has led the Bulls in scoring a dozen times with a dozen games of 20 points or more. Last season, he led the team in scoring once and scored at least 20 points just once. Gibson is the team’s most aggressive dunker with the quickest burst off the floor as well as the unique ability for a big man to defend perimeter players on switches. It’s one of the principal reasons why the Bulls’ defense works so effectively and is rated so highly. Gibson also has been brilliant in his eight starts, averaging 19.3 points and 9.8 rebounds. But you never once hear him complain or question his role as his loyalty to the team and the goal of winning remains unquestioned. And he’s elevated his game as the games become more vital, averaging 14.6 points and 7.4 rebounds since the All-Star break and by far with his best ever free throw shooting since then of 79 percent. Just on numbers, Gibson should be perhaps the strongest Most Improved contender as he’s increased his scoring average this season over his career average by 49 percent and by 67.5 percent from last season. But here’s a player who is better not just because of opportunity and situation. He came back from a summer of hard work with an expanded game that has enabled his team to again become one of the surprises of the NBA. Many wonder how the Bulls could have done as well this season with the loss of Derrick Rose and trade of Luol Deng. They even have an outside chance to win 50 games. The addition of point guard D.J. Augustin was crucial and unexpected. But even more has been the development of Gibson into an offensive option and force that the Bulls never had before. “He’s improved in all areas, offense and defense,” said Bulls coach Tom Thibodeau. “He’s a starter who comes off the bench. He’s played great in the fourth quarter for us. He’s a guy who you can throw the ball into who can get a quality shot. He can also face up to the basket. You can play a pick and roll game with him. He scores in the post as well as making plays. Defensively, he’s as good as it gets, great feet, great anticipation, great multiple effort, great at protecting the rim. The question with awards will be whether that will be lost on voters given some of the bigger names contending in Most Improved, like Davis, Kyle Lowry and Stephenson. Some will even vote for players who already were good, like LaMarcus Aldridge, DeMar DeRozan, John Wall and Blake Griffin because they got better. Even if it’s difficult to find anyone who has changed and added to his game more than Gibson. Gibson ranks seventh among the leaders in scoring for reserves. Others include Reggie Jackson at 13.3, Manu Ginobili and Jeremy Lin at 12.4 and Vince Carter at 12. Since Young, Waiters, Evans and Burks play for losing teams you’d think they will be out of serious consideration. Crawford is by far the scoring leader. But Crawford has won already and has 23 starts. You need only have more games coming off the bench than starting to qualify. But that’s a lot of starts. So then you come down to Gibson and Morris. And as well as Morris has played, it’s difficult to make the case he does more, especially on defense, than Gibson. It’s become a heck of an interesting conversation. One in which the play of Taj Gibson should be one of the prime topics.